Too many chefs in the kitchen who fixed that which was not broken. There is nothing wrong with the new version and Microsoft’s development team did not add any terrible bugs to it. There is a healthy sampling of new features, including a few that can legitimately help with presentation creation and delivery. The interface has not been changed so radically as to be unsettling, and collaborative teams can work between versions 2010 and 2013 peacefully. While several niceties have been added, however, Microsoft did not address the longest-standing issues with the software, and this product comes up short with two important demographics: 1) advanced users who require better access to the tools they use most often; and 2) users who need help avoiding Death by PowerPoint. In fairness, it might be asking too much of software to address the human condition and the things that come over people as they are asked to perform the scariest of activities — speaking in public. But I sure wish that Microsoft had tried. More on these issues soon, but first, here is a tour of the efforts that Microsoft did undertake. Those who team up on presentation projects will enjoy Office’s new roots taken up in the Cloud. Slide decks can be created and saved to SkyDrive locations, invitations can be issued to others, multiple users can work at the same time, and comments can be made and viewed by all concerned. The new Present Online feature enables you to show slides to a group, as well, making it easier for teams to critique a presentation remotely or to give mini webinars. Present Online is a nice evolution of the old Broadcast function. PowerPoint 2013 supports the appeal of wide-screen presenting by making it the default for new slides. It also has tweaked the actual sizes to make slides more print-friendly, and above all, has reduced the risk of distortions that tend to befall imported photos and graphics during conversion from one aspect ratio to another. New guides make the visual alignment of objects easier, and to many, this stands as one of the most compelling new features. While the Alignment tools are the more precise options, they are often made difficult to reach by the context-sensitive interface. But with just your mouse, you can more easily align and evenly distribute objects. 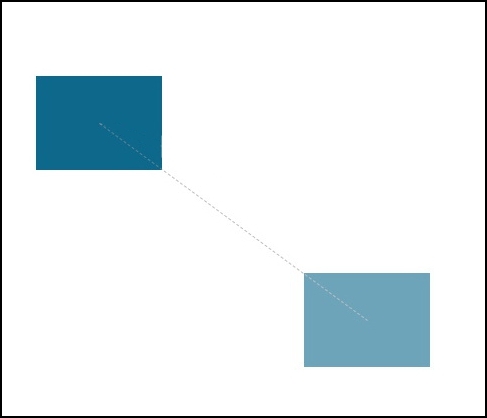 As Figure 1 shows, you can even distribute objects across the slide using visual alignment. Version 2013’s alignment tools bring much more precision to your mouse than ever before. Also, guidelines can be colored, locked, and distinguished between permanent guides (that you might want to place on a slide master) and temporary ones (that you would choose to add to a slide). A color picker has been added to the interface, and while not as useful as it could be (not so easy to sample from outside of slide objects and doesn’t report the color values), it’s a big step in the right direction. Those who use motion paths will appreciate being able to see a preview of an object’s final destination. This is done with a ghosted image that appears on screen, as you can see in Figure Two. Most advanced users would have preferred a dialog box that offers pixel coordinates, but this is an improvement. A ghosted preview of a motion path’s ending position removes much of the guesswork. Also on the subject of animation, you can now select an object in the middle of a sequence and test the animation from that point. This is easier than using Selection & Visibility to temporarily hide objects that appear earlier in an animation sequence. Task panes have seen wider adoption as many dialog boxes have been converted into docked panes. You can still pull them from their docked positions if you want to float them. Finally, there are a few new transitions and a couple of previously-abandoned animations now resurrected. Peel and Page Curl are the most interesting among them, allowing us to simulate the turning of a page. I sincerely hope this does not spawn a whole generation of gratuitous page-turning transitions. Heading this list is an overhauled and redesigned Presenter View, tuned for touch and tablet control. This will be great for webinars as virtual presenters can use Presenter View on a secondary monitor to keep many more tools at the ready. It’s also noteworthy that you can access it even if you are just on your notebook PC practicing in a hotel room. Press Alt+F5 to see the new Presenter View at any time. Figure Three shows its overhauled interface. Tuned for touch, geared for webinars, handy in any environment, the new Presenter View packs a lot of control into a single interface. The right-click popup menu that lives in the lower-left corner during slide shows has been redesigned. You can now zoom in on portions of the screen and see a thumbnail display of all slides in the deck for quick navigation. It is also repeated in Presenter View and you can see it in Figure 3. Video export receives a second format choice of MPG-4. In fact, it is now the default choice over WMV, as it should be. This would be a perfectly fine list of improvements, tweaks, and refinements, if it were not for the fact that Microsoft seems to have ignored the wish list of so many of its users. Based on my surveys of clients and colleagues, here are the issues with the program whose lack of attention will not be well received. It is little wonder to me why the reputation of the Animation engine suffers, given Microsoft’s apparent neglect of it. The boomerangs and spirals are the things that people remember the most, instead of the smart sequencing of complex objects that could make the presenter a better storyteller. Microsoft does not seem to give much priority to it and that is perhaps why some organizations actually ban all use of it instead of encouraging its employees to use it properly. At our conference and in visiting with clients, I have a front-row seat to the type of effort PowerPoint users make. I watch them work hours a day on projects and am witness to the level of mouse-clicking they must undertake. In an age where so many workers are at risk of repetitive-stress injuries, it is inconceivable that a component of the most prominent software appliance in the world, Microsoft Office, does not offer the kinds of tedium-reducing measures that have been part of software development since the mid-1990s. 6. Change .5 to 1. If the software allowed us to establish our own defaults, steps 2-6 would be eliminated, instead of required for every single animation. I know about the Animation Painter, which can apply animation from an existing object; it’s not enough. I know about the Zoom slider and the Fit Slide button; why don’t we have marquee zooming after all these years? How come Word has allowed its users to assign a custom keystroke to any command within the program since Office 97 and PowerPoint has yet to offer it? In my view, creating better access to the tools that users use most often trumps any new feature the development team might contemplate. The biggest scourge facing presentations today? While that question could spawn hours of conversation (and does, regularly, at our annual conference), I’m going to boil it down to one thing: people are asking their slides to perform the roles of the visuals during a presentation and the handouts to be distributed afterward. In the eyes of many who comment on the industry, this is one of the worst strategies to adopt. It requires users to create deficient handouts or it requires them to overbloat their slides, resulting in certain Death by PowerPoint. Microsoft has heard from prominent commentators for many years now that it needs to create a dedicated, intelligent handout function, because encouraging users to print slides often makes the situation worse, not better. And yet, the Handout function in PowerPoint 2013 underwent no change whatsoever. The inference to be drawn here is that Microsoft continues to believe that the best way to create handouts is to reprint slides, even though you won’t find a single authority in the field who would agree with that. Some would argue that PowerPoint partners with Word or OneNote for that purpose, but I believe that is an unacceptable solution. PowerPoint cannot be allowed to ignore one of the core tenets of the presentation experience; it must evolve in how it approaches the task of creating handouts and leave behinds. The irony is that a better solution exists within the software, and I have written about it on several occasions, advocating that users use the Notes page for handouts. But users shouldn’t have to sacrifice their ability to store speaker notes in order to create better handouts. This too stands as a more important issue than all of the areas that saw change in version 2013. Combined. To hundreds of thousands of PowerPoint users, the most important thing the software can do is help them off of auto-pilot, where they walk like zombies into a world of titles and bullets. 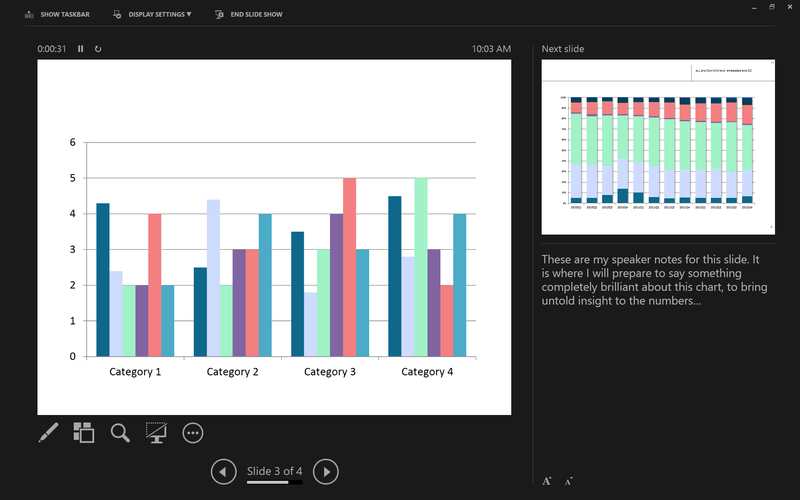 As Figure 4 shows, Version 2013 templates are new, clean, and attractive, and the built-in search will be welcome. But they don’t address the rampant problem that many who use the software simply don’t know the right way to use it. The new Presenter view is impressive…but asking speakers to concentrate on their own screens could be the exact wrong thing to do. Version 2013 sports attractive new templates, but they help design-challenged users? Maybe not. There is a strong counter-argument to this: is it the software’s job to police how its users employ it? Is PowerPoint supposed to act as the police to its users? Do any other software programs have to deal with this? I appreciate the point of view, and in fact, can think of very few programs in PowerPoint’s predicament. Few other program are so closely associated with its output. Photoshop has become a verb but it has a positive connotation; Death by PowerPoint is in everyone’s lexicon and it is decidedly not positive. So I get it that this is hard and I appreciate that few other programs carry this burden. I would like to think that the most prominent software in the world could rise to this occasion. Slide makers and speakers need to be encouraged to explore the needs of their audiences, craft simple messages that speak to those needs, and deliver those messages in the most natural and unencumbered way. So much of PowerPoint 2013 is focused on the software’s support for touch control on tablet PCs, but I can still count on one hand the number of clients or conference patrons who own or use Windows-based touch-capable devices. I recognize the value of tablet support and I applaud the implementation of it. It might not be too far into the future when every notebook PC sold supports touch, so I understand the priority that Microsoft has placed on it. However, the elephant in the room weighs 12 tons: Until this type of support is offered to iPad users, it will remain at best, a curiosity, and at worst, a source of irritation. At the time of this writing, any PowerPoint support at all for the iPad has not ventured past the rumor stage. This is a recurrent theme for PowerPoint 2013. Themes have been improved…most users do not use them. File and I/O dialogs insist on offering SkyDrives as a location…few have yet to adopt them. Microsoft fixed a lot of things that few of its users felt were broken, and that wouldn’t have been such a bad thing if the developers had addressed the areas its users believe really do need to be fixed. Is Innovation a Lost Concept? I am treading on delicate ground here because I do business with Microsoft, rely on the company’s support for my training initiatives, and am on friendly terms with many on the development team. I’m not sure if I make my situation more or less precarious when I absolve the PowerPoint team of a certain level of blame. There are just so many cooks in this kitchen, and the master chefs are the decision makers at the suite level who decree the priorities and the critical areas of focus that must be heeded across all of the Office suite. PowerPoint must play along, whether or not it is in its users’ best interests. Microsoft’s internal culture does not help here, either, as the company’s massive org chart does not encourage innovative thinking in the right places. The PowerPoint development team is located in Mt. View CA and there is no shortage of energetic and talented people in that region who could join the team. But most avenues of advancement within Microsoft would see those people being transferred to company headquarters in Redmond WA. To young professionals who want to stay in the SF Bay Area, that is not much of an inducement to join the PowerPoint team, think creatively, stand out from the crowd, and earn a promotion. The PowerPoint team in Mt. View has some wonderful people on it; I wish that more would decide to stick around and pour their energy into the product. For whatever the reasons, most of the PowerPoint 2010 team left the company after the release of that version, and the same can be said for those at the suite level who were tasked with creative control. PowerPoint’s position is secure as the dominant player in the presentation space. Perhaps our industry would be more interesting if that were not so. If Prezi continues to turn heads and make a name for itself, if Google continues to evolve its free cloud-based tools, if Keynote continues to siphon users who have a choice of operating systems — if these developments continue along their pace, Microsoft might not be able to afford to focus on features whose values are largely speculative. I’m all for anticipating trends and needs, but not at the exclusion of such glaring weak spots. Version 2013 isn’t bad software; it’s just not the software that most of us have told Microsoft we want. The next time you update your Office suite, version 2013 would be a fine choice. If you need to collaborate in the cloud, it might rise to the level of compelling. Is there anything else in it that cries out for you to upgrade now? I don’t think so. Great analysis, Rick. And a sharp mixed metaphor! I stop deleting my email often enough to read interesting articles. This article qualified except for the fact my stopping was prompted by my multi-year avoidance of Powerpoint. At a recent conference I was struck by how creative people were with their presentations. And although I’m no expert (see above) I think most of them were created in Powerpoint. Although many of the presentations were thoughtful, well-informed and presented only one blew me back in my chair (visualize the Memorex ad here: http://tinyurl.com/k22t757). This, I later found out, was created in Prezi. OK…so I’m not generally someone who says “never” but once this tool was in my hands I thought: why Powerpoint? 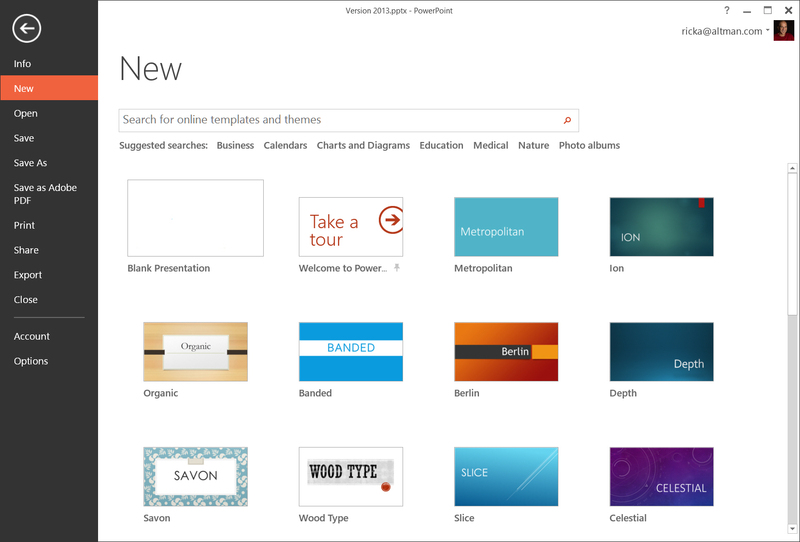 All I can say is there are much better informed presenters than me out there, but I don’t see myself going back to Powerpoint unless I’m forced to for some reason I have yet to discover.